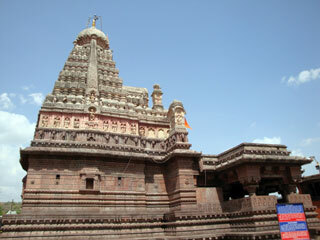 Ghrishneshwar is famous for the very ancient and the very holy Ghrishneshwar temple in this place. It i one of the shrines that is very revered all over the country. 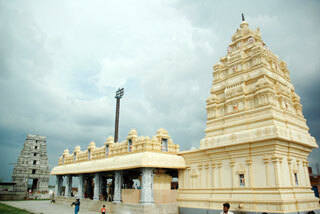 This temple is the holy abode of one of the 12 jyotirlinga of Lord Shiva. This place is about 11 km from Daulatabad and very near Aurangabad which itself has so many more beautiful monuments to explore. Ahilyabhai Holkar is that very important person who constructed this temple. Not only that he also re constructed the Kasi Vishwanath temple that is in Varanasi. 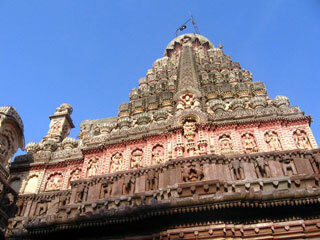 Grishneshwar is also known as Ghushmeswara, Kusumeswar, Grushmeswara. There is also a story attached to the holiness of the this temple which speaks of great divinity and thus makes this temple more tempting to all its followers. A fine example of medieval architecture, this is the one temple which is made of red volcanic rock and thus it gives this temple a very characteristic expression. It is an absolutely unique temple and thus is a must see in India. 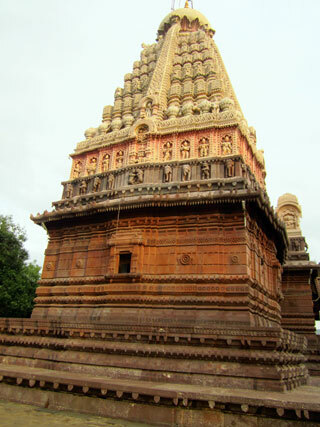 The most impressing feature of Ghrishneshwar Temple is the 5 tier shikara. The shikara rises in decreasing height. The height is then increased with the help of the high wall component of the sanctum. An unerect bull at each corner and monkey behind it is the crown of the Shikara. Thus it is one of the temples which is not only visited for the dety of Shiva in it but also for the brilliance of its architecture and the beauty of the rocks that built it.